Finally, Bore-Whips cleaning pull throughs are now available in .22 caliber. 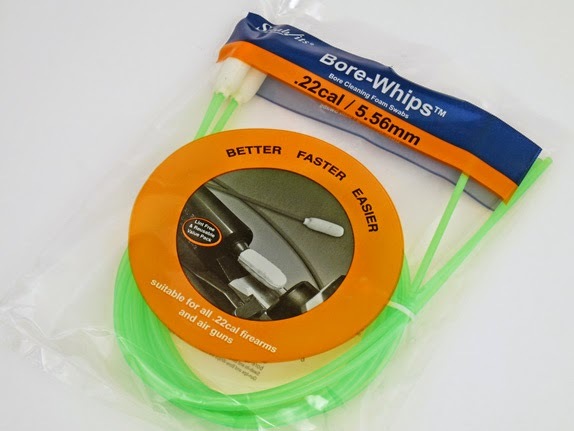 Price for the .22 Caliber Bore-Whips is the same as for the .177 caliber version and they work just as well, but they're green instead of orange so that we won't get them confused! Also like the .177 version, the .22 Caliber Bore Whips can be left in the barrel as a safety indicator, showing that your air rifle is "safe" and cannot be fired. Bore-Whips make an ideal cleaning solution for airguns. They clean the bore well, without the risk of damage that can occur to shallow, fragile airgun rifling if too aggressive cleaning with a metal brush is undertaken.